I am going to try to get Gia Canali to take pictures of invitations for me every day!! I know she is too busy for that… but I could just park myself at her studio and see what happens…. not only is she super FUN to work with, she is just so talented… Thanks Gia!! Here are just a few from our most recent afternoon of picture clicking. There is even a THEME! All of these incorporate the wonderfully naturally scented cedar wood veneer. The top one is a little program that has stitched wood front and back cover – with white pages in the middle… so sweet! 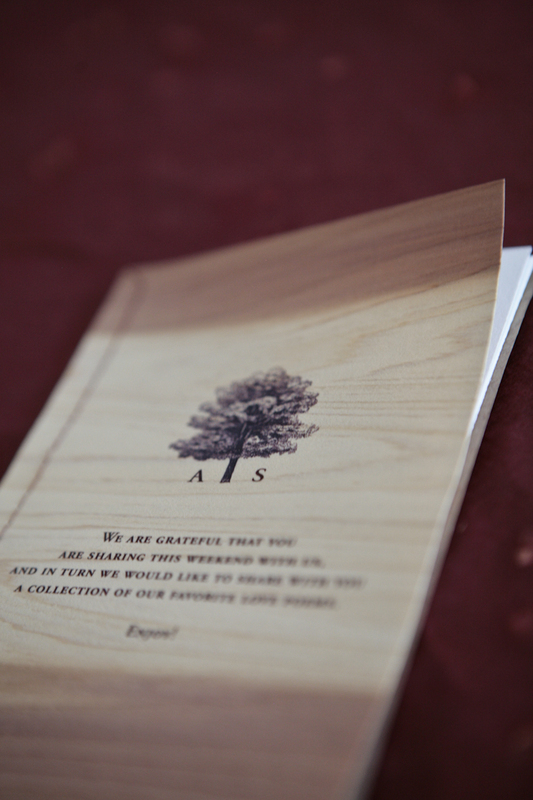 To the right here is a lovely invitation that has a cedar border – you can sort of see it on the edges. The drawn tree is actually based on a pepper tree, but cedar is such a lovely shade for a backyard wedding…. it’s all about the trees! And to the bottom here is a save the date printed on cedar with a little photo of Big Sur printed on recycled paper and attached to the side for a little peak into that wonderful landscape. Thanks for coming on the tour… any questions? This entry was posted in art, invitations, paper, photography, printing, stitching, Uncategorized, wedding invitations and tagged Gia Canali, Letterpress, tiny pine, wedding invitations on March 17, 2010 by tinypine.